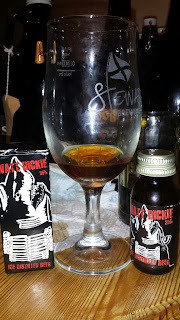 Back in August, Steve Lamond came down to help me drink some beer I had in my cellar. He brought some beer himself so here's what I hadn't had before. I was driving us down to Waterford the next day for the Beoir AGM so couldn't drink too much. So we finished at a respectable time before retiring. 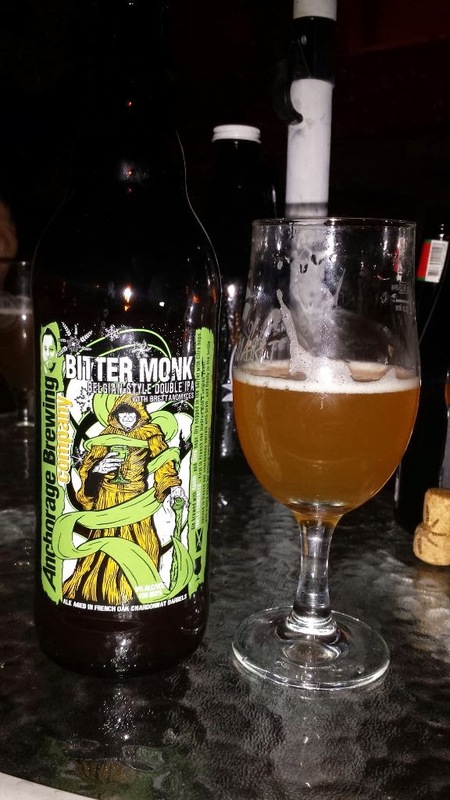 From the Anchorage Brewing Company we have Bitter Monk. It's what you might call a Belgian style double IPA. So what's that then? Well you take a double IPA, ferment with a Belgian yeast, age in French oak Chardonnay barrels and add a little Brett. The result is a beer that smacks of lemon sherbet and other citrus fruits on the nose. There's an almost limbic sourness but this is a double IPA and you never forget that either. It's a fantastic beer and I loved the lingering bitterness mixed with the funk from the brett. I'll have to brew something like this some day. 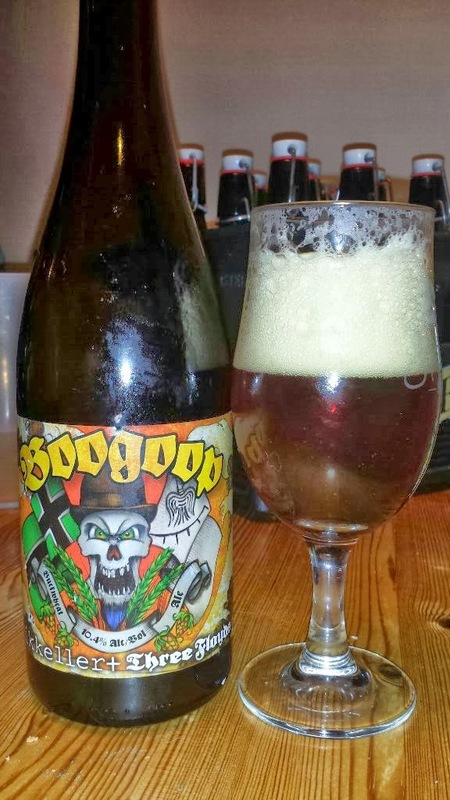 Mikkeller and 3 Floyds got together and and brewed Ruggoop, a 10.4% bareley wine. There's not a lot on the nose but I often find that with barley wines. A little alcohol and some citrus and pine. I found it to be a very malt forward beer with lots of orange. There's a little spiciness to the finish. A very nice beer to sip. 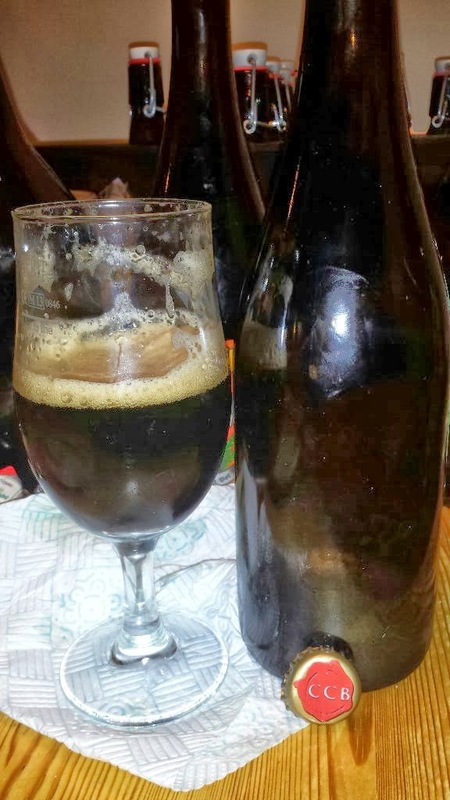 Cigar City's Papsø’s Passion Fruit Porter is an odd one. Odd in a good way though. There is plenty of fruity as you might expect. I thought it seemed a lot more like raspberry rather than passion fruit. I found a fair bit of chocolate but very little in the way of coffee which is a good thing for this beer. I'm not one for fruit infused beers usually, not unless they are done very well and this one was done brilliantly. I loved every sip and at only 6% it was a welcome respite from some of the other beers. Evil Twin Brewing is interesting. It's a Danish/US gypsy brewery founded by Jeppe Jarnit-Bjergsø who is brother to Mikkel Borg Bjergsø of Mikkeller fame. The two are brothers and sort of rivals I guess. 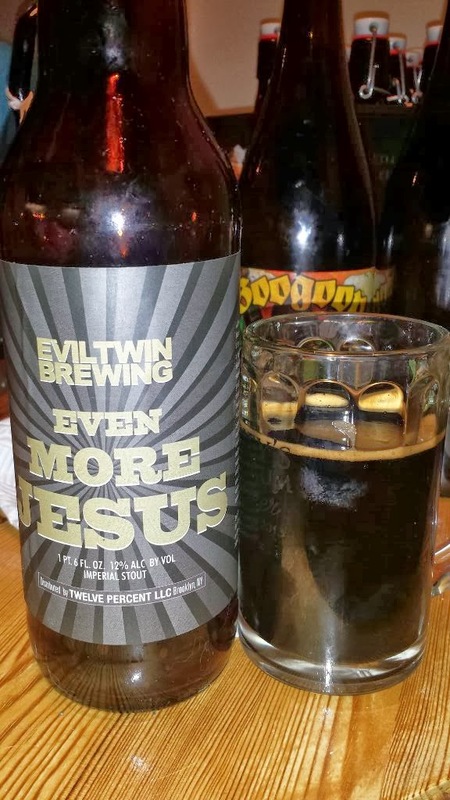 This beer is called Even More Jesus and is an imperial stout with a substantial 12% ABV. Aromas of coffee, chocolate and vanilla with a thick viscous body, strong oaky vanilla on the palate. It's very sweet, very strong flavoured and just beautiful. 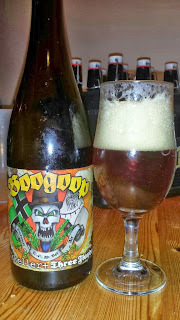 I especially enjoyed a slightly lactic sour finish. Steve also brought along a bottle of Watt Dickie, Brewdog's latest foray in to the beer/spirit market. It's basically a freeze distilled IPA and comes in a tiny little cough syrup looking bottle in a little cardboard box. Stocking filler perhaps? There is likely to be a large bottle in the near future too. The aroma is a hoppy and alcoholic one with peach and orange coming through in the hoppy department. It basically tastes like strong medicine though. Orange Bitter pithiness and hops. I actually would try this again, if for no better reason than to see if I get any more from it than the little serving I had. This was at the end of a tasting session so my palate was fatigued. Odd but not vile. Next one at mine sometime soon? Not sure about soon.... I have so much on it's not funny.